We have a large inventory of roll-off containers in stock and ready for delivery to your home, business or job site. Our professional staff is here to make the dumpster rental process a quick and easy one, even if you’ve never rented before. Our containers are clean and well-kept, and we take every precaution to minimize the risk of damage to your driveway, yard or property. We provide a level of service unmatched by other dumpster rental companies. We offer a wide range of container sizes, including 10, 15, 20, 30 and 40 yard dumpsters. We’re sure to have the right container for the job, and we can have it dropped off in some cases the same day! You won’t find a more affordable and reliable roll-off container provider in all of West Michigan. What makes CDR Disposal different? We’re a locally-owned, family-run business that treats each customer with respect and gives them the attention they deserve. We have more than 50 years of experience in the waste hauling business. Our inventory of dumpsters includes both compact and full-size containers ranging from 10 to 40 yards to handle any size cleanup. We’re a member of the U.S. Green Building Council West Michigan Chapter, and we can help your company get LEED certified. We offer a comprehensive recycling program to dispose of waste and debris in an eco-friendly manner. Our experienced drivers take every precaution to ensure no damage is done to your property during drop-off and pick-up. Sure we offer competitive pricing, but it’s our superior level of service that truly sets us apart from other rental companies! Give us a call at 616-318-0835 and describe the type of project you’re working on and/or type of debris you’re disposing of. We’ll suggest a dumpster size for your project, or you may choose any of our available sizes. At this point we’ll also discuss other details, such as pricing, rental duration, overage fees, drop-off date, etc. One of our drivers will drop off the dumpster at your home, business or job site. You don’t even have to be there during the drop off! When you’re finished loading the container, simply give us a call and we’ll come pick it up. It’s as easy as 1-2-3! People rent our dumpsters for a variety of reasons, including home cleanouts, commercial building cleanouts, demolition projects, construction, roofing jobs, yard debris cleanup, estate cleanups, community cleanup event, and much more. 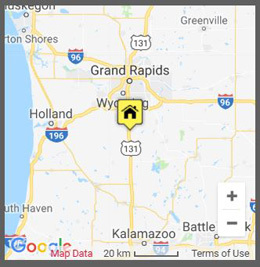 For affordable dumpster rental service in Grand Rapids, Kalamazoo and Muskegon, CDR Disposal Service, Inc. is the local choice!